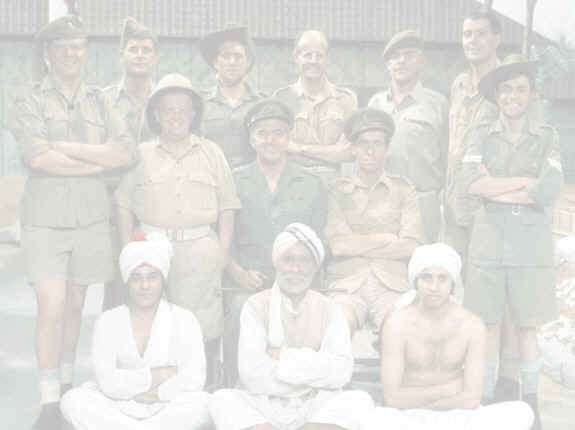 Episode 1 : "Monsoon Madness"
The heat is unbearable as the monsoon season is about to get underway, and the Sgt Major discovers that the Concert Party haven't been taking their salt tablets. The Sgt Major says he can swallow six - and is promptly sick. Meanwhile, Lofty is imagining that the Sgt Major is the cause of all his woes, and plans to kill him, but recovers when the monsoon's arrive. Episode 2 : "Kidnapped In The Khyber"
The men put on a show at the Northwest frontier, the Colonel goes with them as does Mrs Waddilove Evans with whom the Colonel is having an affair. On the way they meet some tribesmen who try to sell them pornographic books, which they confiscate. Later that night, they take shelter in an old fort and the tribesmen kidnap Mrs Waddilove Evans. A sack is thrown over the wall, and the Concert Party think it is a piece of her! Episode 3 : "A Fate Worse Than Death"
In the sack is a melon and a note demanding the books that were confiscated and a demand for rifles. They get disguised as tribesmen to find Mrs Waddilove Evans but fail. When they return to the fort they find that all their water has gone. Poor old Lofty is sent out with fake rifles to meet the tribesmen followed by the others who aim to ambush the tribesmen. They end up in the wrong place and end up having to drink a mixture of water (from the trucks radiator) with gin and medicine. They all end up drunk and passing out! Mrs Waddilove Evans is returned unharmed evetually. Episode 4 : "Back To Blighty"
The Concert Party draw lots to try and get one of them sent back to Britain. It ends up being Gloria, who tries to get a discharge by pretending to be a woman. The Sgt Major gets arrested for indecent assault when he tries to pull Gloria's clothes off to show he is really a man. Gloria then pretends to overdose on some pills and is sent to hospital. He is finally offered a discharge, but turns it down in order for permission to marry a nurse he has fallen in love with! Episode 5 : "Lofty's Little Friend"
Lofty is sent off on an errand by Captain Ashwood to fetch a plant that has been sent to him. Lofty meets an elephant which eats the plant, and follows Lofty back to the camp. One there it causes chaos. The Concert Party try to get rid of it but fail. Area Command order for it to be shot, but the owner arrives just in time to save it. Episode 6 : "Flight To Jawani"
The Concert Party fly to a remote airfield to put on a show for a group of airmen who haven't seen a woman in years. They think Gloria is a real woman and the Colonel decides to do the show without Gloria, but the airmen become restless and start shouting "We want Gloria", so Gloria says they should ALL dress up as women and that way the airmen will realise they are all men. He is wrong and the airmen make a dash for the stage and the Concert Party have to make a run for it, getting to their plane before the airmen do! Episode 7 : "We Are Not Amused"
The Concert Party have to put on a show for the District Officer who is very patriotic, so Capt. Ashwood writes a pageant about the British in India, which the Concert Party thinks is rubbish, but they still have to perform it. On the night the District Officer is unable to attend and sends a deputy - who is Indian- in his place. The pageant goes ahead, but the Sgt Major has to translate the show to make it less "offensive" to their Indian guest. Episode 8 : "Twenty-One Today"